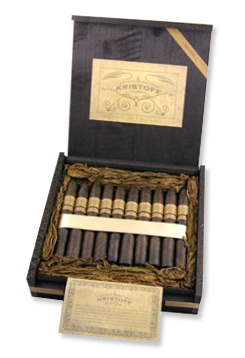 Kristoff Maduro cigars are beautifully wrapped in a rich, oily Brazilian maduro leaf and finished with a pigtail and shaggy foot. Like Kristoff's original Criollo cigars, the medium-bodied Kristoff Maduro offers notes of toasted almonds, hints of spice, and creamy chocolate, but the maduro wrapper adds wonderful undertones of earth and licorice. The Kristoff Maduro is blended by Kristoff's master blenders and handmade in the Dominican Republic with nicely aged Dominican Olor and Cuban seed Nicaraguan tobaccos. These tasty, enjoyable cigars are packaged in a rough-cut cedar box of 20 surrounded by loose tobacco.